An example process application diagram created on Dragon1 in the Visual Designer. This tutorial will guide you through the steps to create an interactive Process Application Landscape on Dragon1. And the tutorial will learn you how to publish this visualization on the devices of the stakeholders who want to use to it, to manage projects, processes and IT. This tutorial from start to finish takes about 4 hours if you have never done it before. And if you have created landscapes for about four or five times, this tutorial can be done within an hour. You can do this tutorial all by yourself or split the task up in a group. This tutorial learns you to create a dynamic architecture visualization, not a static architecture visualization. Meaning that once setup, if the data or the model is changed, the published visualization that is seen and used by stakeholders via the Content Viewer on their iPad or iPhone is also automatically updated. Of course you can also make static backup copies that do not change. What is a Process Application Landscape? Why create a Process Application Landscape? In the following paragraph each of these learning objectives is discussed. A process application landscape is the structure and/or coherent set of all important business functions, business domains, business processes, information systems, services, business objects, modules, functionalities, building blocks, software applications, components, interfaces and databases and their platforms, technologies, types and interdependencies, with regards to business continuity. The difference between a process application blueprint and a process application landscape is the level of detail and its purpose. The purpose of a blueprint is to guide design and building activities. A blueprint therefore contains functional and technical details. The purpose of a landscape is to inform about structure and dependencies to management. A landscape therefore contains generic functional and technical information. A second definition is: a process application landscape is the management overview of all business processes, business objects and software applications in an organization. Next to the definition that comes from the Dragon1 open EA Method, we advise to visualize landscapes using a certain View Layout. As architecture is defined as a total concept and seen as the bridge between strategy and transformation, architecture visualizations are best visualized with strategy at the left hand side, architecture in the middle and transformation at the right hand side. In this way stakeholders will see at the left 'why things need to be done', in the middle 'how the solutions must be build' and the right 'how building of the solutions must be executed'. 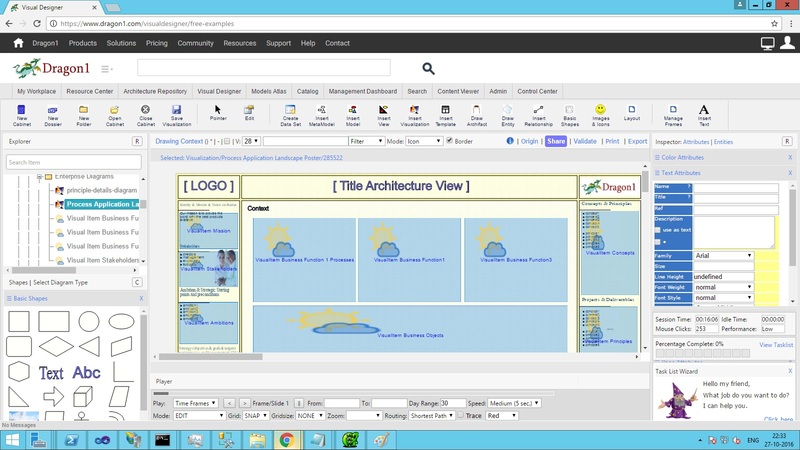 In this way the architecture visualizations created on Dragon1 can be used to manage projects and direct changes. If you are going to create a process application landscape you need to create a cabinet, dossier and some folders in your repository where you can store data in. Typically you would set up folders like: Data, Models, Views, Viewpoints, Visualizations. You can now start creating a process application poster by importing data automatically or entering data manually. So you either follow this step or skip it and go to the second step. As said in the definition of a process application landscape, you need to have certain data in order to be able to create a process application landscape. This data is often available in all kinds of systems and spreadsheets in your organization. And the data will be stored in the folders you created. Every Entity class by default has 10 user data attributes, like name, title, description, type and a few system data attributes like internal ID. Now it could be that you want your own data attributes for an entity class. Say you want to administer Budget at stakeholder, you can enter Budget as User Defined Attribute. And when importing data, entering data and creating views and indicators, you can make use of that value. We have discussed import data automatically, now we look at entering data manually. If you want to enter a process or application or even enter 100 processes or 100 applications manually, it is a task that can easily be accomplished on Dragon1. Also the data you imported can be enriched. Maybe not all fields you need for views and indicators are filled by default. Now you are at the point where you have data in your folder, but the data is not connected. In this step we are going to connect the data. Creating relationships between entities is called modeling. You give the data structure, shape/form. One unique thing on Dragon1 is that when data changes, the model, view and visualization change automatically. That is why we create models based on stored data. You are going to drag the entities from the folder structure onto a model canvas. This step is not always necessary. It could be that the data entities are used to create a model, but that the model entity is not interconnected with the data entity (an invisible life line one could say). If you switch a model into Normal model, every entity that is not correctly linked to a data item, will be marked red. After we have one or more models that link the data with each other we need to define views. As said earlier the landscape poster is a canvas with a lot of views for various topics on it (strategy, architecture and transformation). And a view is a filter on a model, so for every topic we create a view: like mission, stakeholder, requirements, processes, applications, projects and deliverables. Dragon1 is not only an EA Tool or platform, but also an open EA Method. In this method architecture (as total concept) is placed between strategy and transformation to act as a bridge or integral enterprise blueprint. In the EA Method we have prepared a default view layout for architecture visualizations to accommodate strategy, architecture and transformation. You can insert this template on your canvas. Now it is time to dress up your canvas with a template. 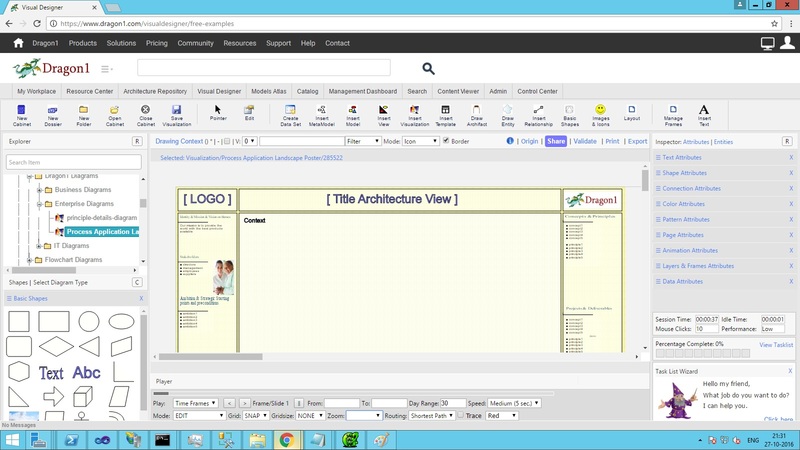 For instance put a background picture on it, upload a logo, or place a domain layout background on the canvas. Drawing shapes on a canvas is as easy as dragging and dropping an item. On Dragon1 you link data in a model and create a view to filter data from a model. You place a Visual Item on a visualization canvas to instruct the system to draw the view with certain shapes, sizes, layouts and colors in the Visual Item area on the canvas. In this view you can place as many views as you like on the same visualizations canvas. Indicators are a specialized Visual Item. Suppose you want all processes that are not documented to be colored red on a diagram, and you want all the applications that need to be replaced this year to be colored blue. You can do this with a Visual Item. But the easiest way to do that is to make use of an Indicator. On Dragon1 you can generate popup dialogs on mouse over of your shapes in the Content Viewer. For this you need to enter at least a description for your shapes. When models are big and complex, tracking and tracing helps to see what is and what is not connected. Tracing means showing a path forwards from A to B. Tracking means showing a path backwards from B to A. Dragon1 supports both. You can create a set of interrelated visualizations by means of clickable links. That is easy to do. How this works is explained below. A common practice is to create an overview visualization where you can click on shapes and next be forwarded to detailed visualizations. This scenario can be created by you. For example, you click on a process or application and that you are forwarded to a process schema or application design. In the Content Viewer you can watch who has worked on the visualization and what the outstanding tasks are for development, usage and maintenance. Depending on your privileges you can see certain information or even can send messages to persons about their tasks. Users may have left some comments in the Content Viewer or you may have been send some messages via the workflow window. Now you as creator of the visualization need to update and change data, model, views or the visualization template. Doing that results into changes and updates in updates windows, so everyone can see you have processed their comments and messages. And of course someone with the same privileges as you in the same account can also processes the comments. In this way you can collaborate on Dragon1. From time to time you as creator or manager will want to print out a report on the progress of creation, usage and maintenance of the landscape. 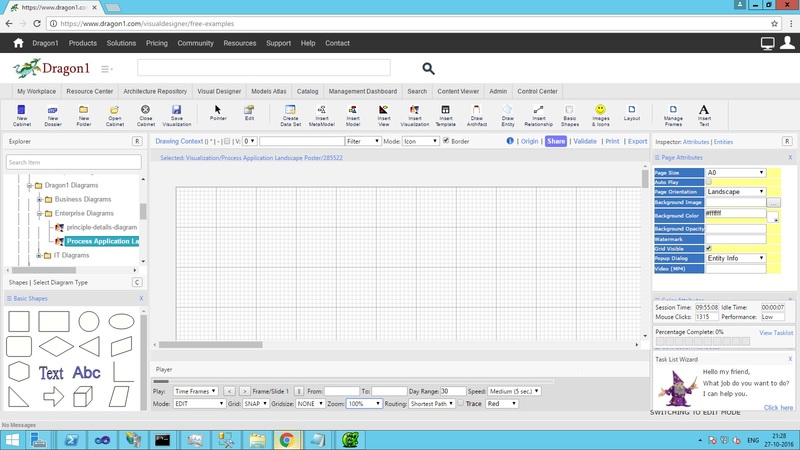 A screenshot of the Visual Designer showing an empty visualization canvas after inserting it. A screenshot of the Visual Designer showing an instantiated View Layout on a Visualization Canvas. A screenshot of the Visual Designer showing visual items placed in particular areas of the visualization.